WE BRING 'EM IN SO YOU CAN TAKE 'EM OUT! Bring in the game! 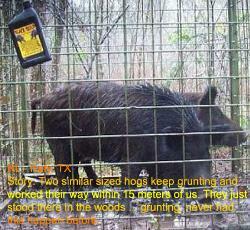 A wild hog’s social and dominance status is based on scent. 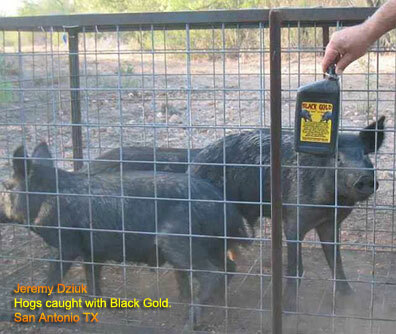 Trophy sized dominant boars love to rub and cover their bodies with strong odors. 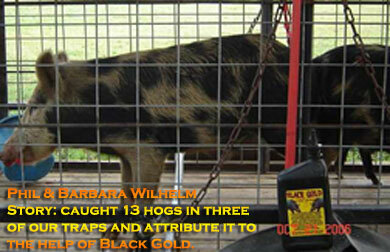 Black Gold drives hogs crazy! 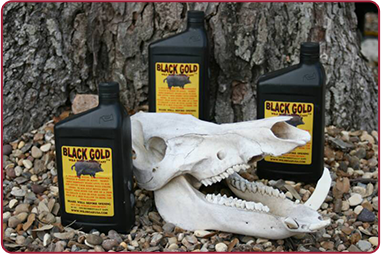 Black Gold is a 100% environmentally safe wild boar scent attractant. It is designed to be used as a rub and is best when applied to the side of a tree or post or when poured over a recently used wallow. 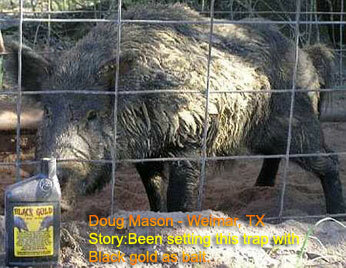 Black Gold has a sweet and sour smell and can also be mixed into a sour corn recipe. WE BRING ‘EM IN SO YOU CAN TAKE ‘EM OUT!